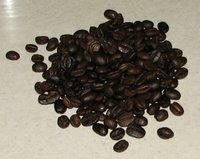 I have been neglecting the home roasting side of my BLOG for a while now. I have had a lot of other projects and life events taking a lot of my time. So it is time for an update and a new blend. I pre roast blend the Brazil and PNG in one batch and the Java and Harar in another. I roasted the Brazil/PNG to the first snaps of second crack, but not into second crack. A good full city roast, dark brown but dry beans. The Java and Harar were roasted just into second crack, about 10 seconds. These were a dark chocolate color with just a hint of oil spotting, full city +. The photo is showing the beans darker than they actually are. I sampled the coffee after a 3 day rest. The extraction was very thick and syrupy. The espresso is a little heavy on the earthy tones. I had cut the Brazil by 5% and increased the Java by 5%. The java is borderline overpowering at this percentage. I increased it to heighten the body, but this is just a but too much body, maybe 23% next time? 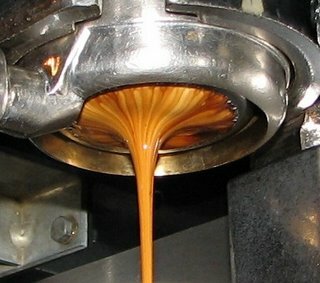 I get a deep, syrupy espresso that coats the mouth. Earth and nut are predominating with a bit of berry and spice in the finish. This is low acidity espresso with plenty of body to cut through some milk. Medium sweetness, I am slightly tempted to add a pinch of sugar.